Star Trek: Timelines from Disruptor Beam, blends characters and settings from all across the Star Trek universe into a mobile strategy game. 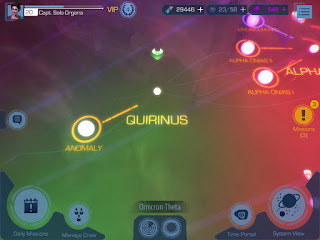 Players will build a crew of their favorite Star Trek characters, and choose which ones are best suited for spaceship battles and away missions. There are other things to do in this game, like leveling your crew members, answering distress calls from various factions, and talking to Star Trek characters about the plot. But the main activities are blowing up enemy ships and sending the right teams on heroic away missions. For away missions, players choose three crew members to form an away team, and then use their particular skills to defeat the challenges posed by that mission. The game keeps the “Star Trek feeling” by allowing players to meet challenges with diplomacy, jury-rigging, and all sorts of non-combat skills. Players have access to a wide variety of beloved Star Trek characters, so an away team might be Troi for diplomacy with B’lenna for engineering and Spock for science. The overall storyline involves a time anomaly, and this conceit makes sense of all the multiple instances of characters. 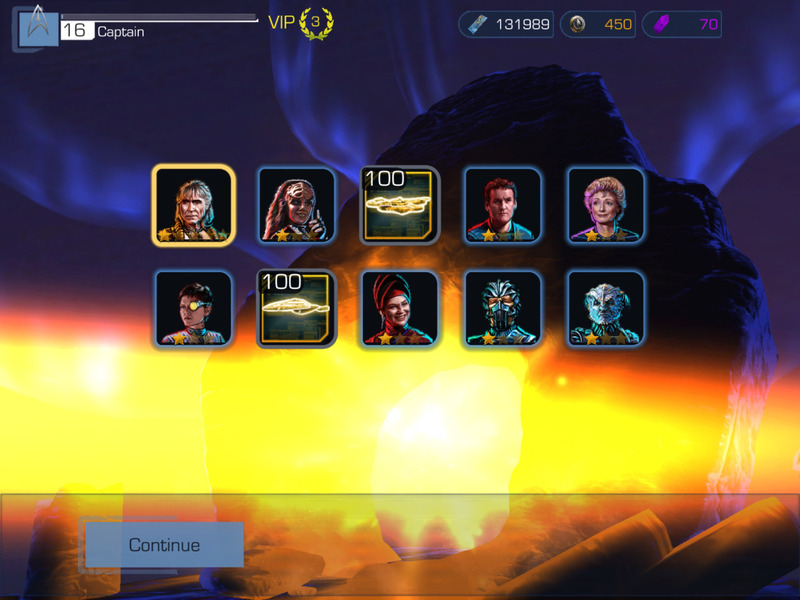 Star Trek: Timelines is freemium, with a solid, though slower, free game experience, and IAP of dilithium crystals -- what else? -- to spend on needed action points and better gear. 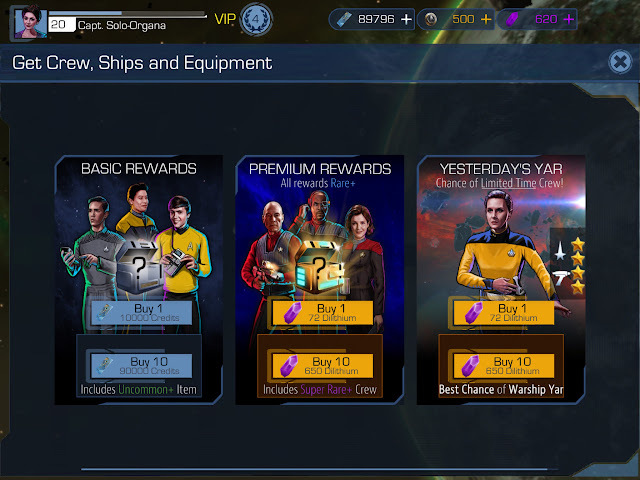 In addition to the various chunks of dilithium for straight purchase, one interesting option is the “monthly pass” which offers extra dilithium crystals as a sign-in bonus for thirty days. In every ten levels, the Timelines crew members will need four items to “advance” and permit experience to be gained from missions. 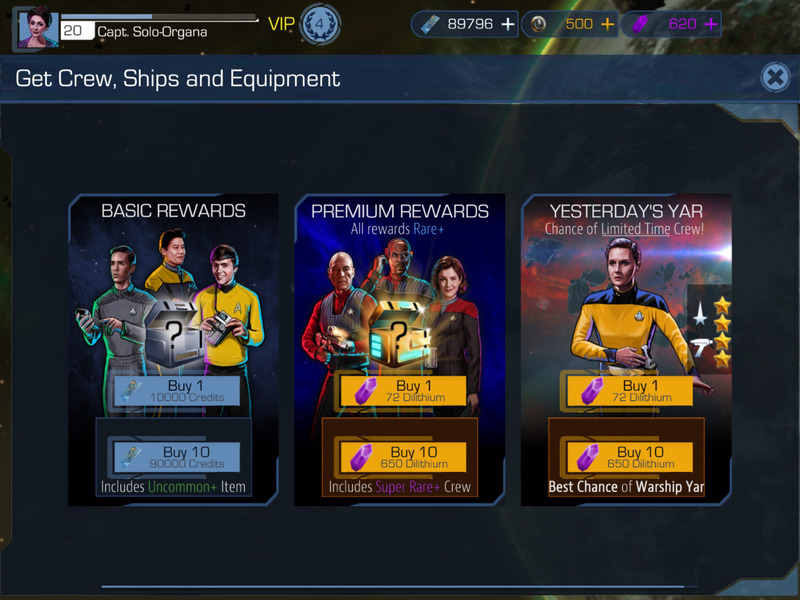 Each item is related to the character (as Janeway wants coffee, or Picard has a saddle), but the drop rate here is either insanely low (we’re talking about 20+ replays of the same battle, looking for one piece of a multi-item crafting recipe) or it might be bugged. The game is fairly new, with occasional downtime while the staff finds and fixes the bugs. I thought this incredibly low drop rate must be the IAP squeeze, but since I could find no way to purchase the needed items (even for premium currency) there’s just an oddly grinding aspect of this otherwise successful strategy game. All your favorite Star Trek characters in one place!